Classic Restaurant is an elegant responsive HTML template for restaurants created by Imaginacion Web and featured at ThemeForest. The template is very adjustable and it can be used for any restaurant niche. 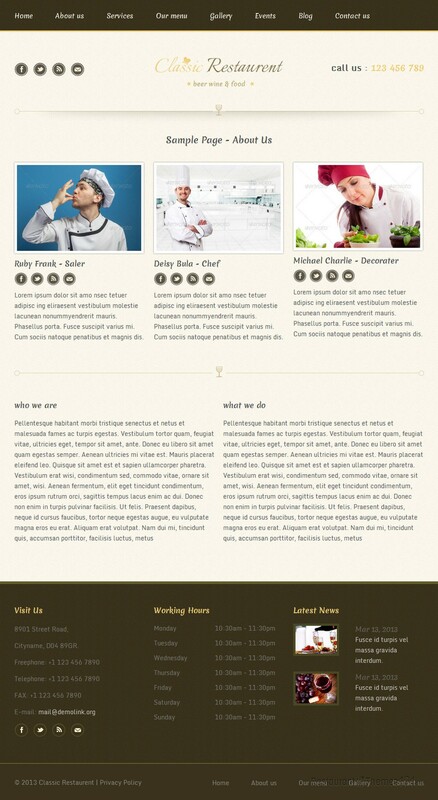 The Classic Restaurant template is built using Bootstrap and it is very easy to customize just about anything. The homepage is enhanced with not one but three sliders. Placing an attractive, wide slider at the very top of your website will surely grab the attention of all your visitors with the quality photos of your delicious food you can post here. You will be able to feature a whole bunch of content on the homepage. Right underneath the wide slider is an area reserved for your featured posts. This is where you can present your most popular servings, your daily/weekly specials or any other nice post you wish your visitors to pay attention to, no matter if it’s introducing your visitors to your restaurants’ history or welcoming them to your club. Announce and share any upcoming event you might be organizing along with photos and exact dates, and feature them on your homepage so everyone knows when the best party goes on. There is no better advertising than a nice praise from satisfied customers, and this template allows you to show nice testimonials from your existing customers, and show everyone just how much people like coming to your restaurant. 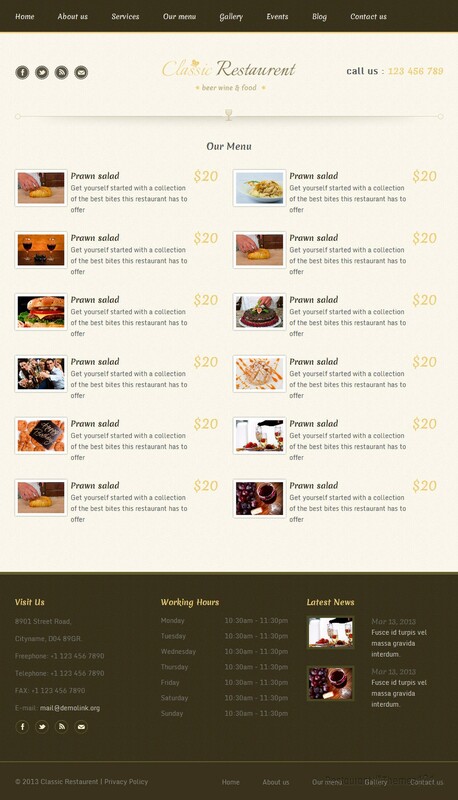 The menu page is nicely organized and you will be able to create an attractive, easy to navigate menu in no time. Your working hours can be also displayed for everyone to see, as well as your latest news or most recent posts. 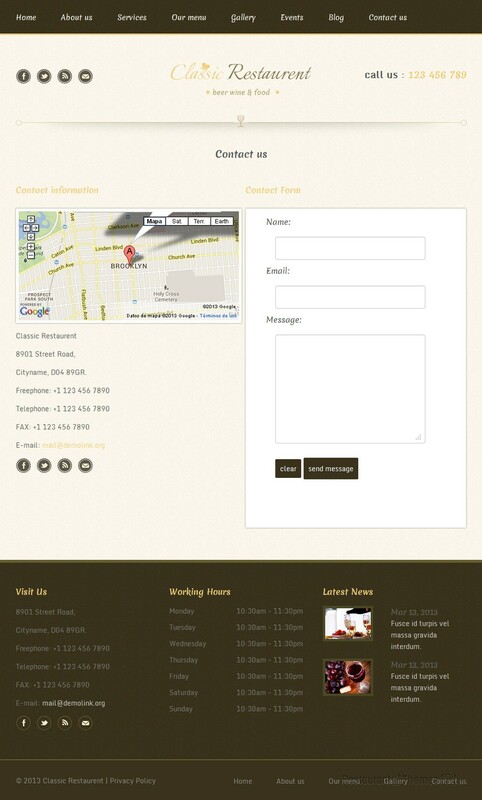 Classic Restaurant features Google Maps, making sure everyone can easily get directions to your restaurant, and there is also a nice and simple contact form included for your visitors to be able to email you easily and quickly. Social integration was not left behind, allowing you to connect to the most popular social networks. 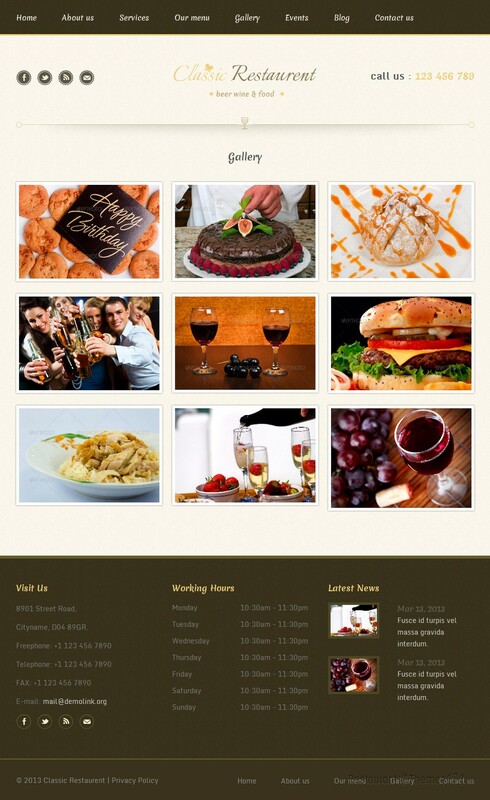 This is a fully responsive HTML restaurant theme. You don’t need to worry about your website looking funky no matter what device it is viewed from. The layout will automatically adjust to any screen size or resolution.